This course introduces algebraic concepts such as the theory and application of variables, graphing, linear equations, inequalities, basic exponent properties, and polynomial operations. Prerequisite: GCA Placement Test Score. This course, an extension of Algebra I, emphasizes polynomials, exponent manipulations, matrices, functions, and an introduction to trigonometry. Prerequisite: Minimum grade of C in Algebra I. 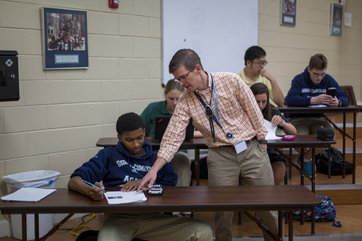 An Advanced Placement course designed to help prepare student to take the AP Calculus exam at the end of the school year. This course covers limits, derivatives, application of derivatives, integrals, and techniques of integration. A fee is required to apply for the AP exam. Prerequisite: Completion of Pre-Calculus. This course covers problem-solving strategies in consumer-oriented situations, such as budgets, checking and savings accounts, risk management, debt management, investments, mortgages, income taxes, and deductions. This course covers relationships between figures, figure measurements, and the classification of figures. Deductive and inductive reasoning are used to justify properties and theorems. Prerequisite: Minimum grade of C in Algebra I. This course is an extension of Algebra II which emphasizes polar graphing, trigonometric identities, decomposition of fractions, and an introduction to limits. Prerequisite: Completion of Algebra I and Algebra II. This is a course in which students will be introduced to the major concepts of data description, probability, interpretation of data, and statistical problem solving. Students will learn the course concepts through hands-on experimentation and investigation. They will analyze existing data as well as data collected through surveys, observational study or experiment. They will then display the data in different ways, analyze it, and draw conclusions based on the results. The four main components of the course are: exploring data, data collection, probability, and inference. Prerequisite: Minimum grade of C- in Algebra II.